MINNEAPOLIS--(BUSINESS WIRE)--Aug. 14, 2013-- Piper Jaffray (NYSE: PJC), a leading investment bank and asset management firm, announced that its annual Heartland Summit event is underway, drawing a select group of 175 top executives, investors and physicians from across the healthcare spectrum. Featuring a unique panel-only format, industry leaders gather for two days for candid discussions on major areas of growth, opportunity and controversy in medical technology, therapeutics and healthcare services & information technology. 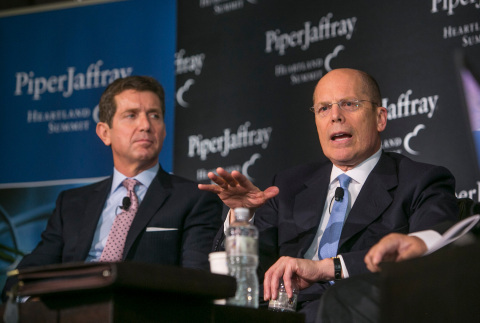 The Piper Jaffray Heartland Summit kicked off today in Minneapolis with a “State of the Industry” CEO Panel featuring leaders from some of the world’s largest healthcare organizations. Neal Patterson of Cerner Corporation, Alex Gorsky of Johnson & Johnson, George Halverson of Kaiser Permanente, Omar Ishrak of Medtronic, Inc. and Steve Hemsley of UnitedHealth Group shared their views on innovation, market opportunities, controversies, acquisition strategies and regulatory challenges impacting their businesses. The CEO panel was followed by a keynote address from Mike Leavitt, former Governor of Utah and the 20th Secretary of the U.S. Department of Health and Human Services. Leavitt shared his inside perspective on the role of government in the healthcare sector, and spoke about his current efforts implementing the Patient Protection and Affordable Care Act. Afternoon panels featured topics in healthcare information technology and biotechnology, showcasing leaders from Array Biopharma Inc., Cerner Corporation, Endocyte, Inc., GNS Healthcare, Inc., Infinity Pharmaceuticals and Optum. A Chief Medical Officer Panel concluded the day’s presentations with CMOs from Covidien, St. Jude Medical Inc. and UnitedHealth Group discussing economic and clinical hurdles, market product strategies and evolving global regulatory environments. Day two of the Piper Jaffray Heartland Summit will consist of panel discussions on major therapeutic opportunities for device therapies in peripheral disease. The Peripheral Vascular Disease (PVD) Panel and Hypertension Panel will combine healthcare executives and physicians from across the U.S. to discuss opportunities in these markets. Panel participants will include executives from Boston Scientific Corporation, Covidien, C. R. Bard, Endologix Inc., Medtronic, Inc., St. Jude Medical Inc., The Spectranetics Corporation, UnitedHealth Group and Volcano Corporation.